I wasn't planning on sharing this recipe but it ended up so photogenic and delicious, I figured I should. Like I was saying in my last blog post, I went to a North Indian cooking class - shoutout to Colin - the other night and was reminded about the glories of curry and spices. So here is another recipe inspired by that class. Although at the same time I am putting what I learned in the class to shame because we were taught how to make fresh garam masala and yet in this recipe I am still my can't-be-bothered self and used pre-made green curry paste. I AM SORRY. I just really wanted curry and couldn't be bothered to go to the grocery store to buy the necessary spices, heat them all up, let them cool and grind them when I could simply take the curry paste outta the fridge and use that instead. I WILL get around to making my own garam masala, and you should too. It smells heavenly and makes you feel fancy. It is also super easy. I don't have any good excuses except laziness. Take it or leave it. 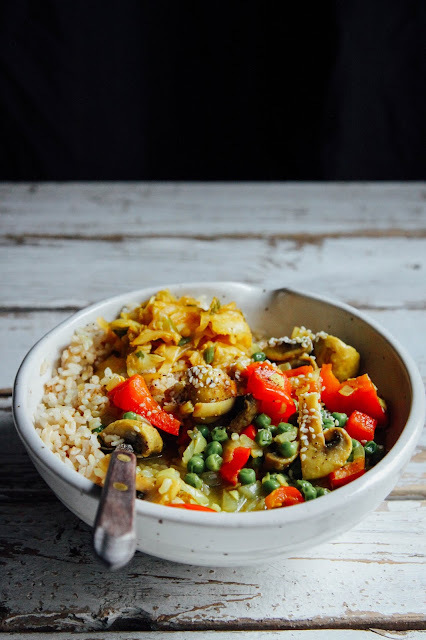 Something from the class that I took away and used in this recipe is the same thing I talked about in the last blog post, namely that turmeric + black pepper is a winning combo, nutrition-wise and obviously it tastes good too. For real: the healthy stuff in turmeric (curcumin) is at least 200% more bioavailable when paired with piperine (the stuff in black pepper). WOWZA. Well let's face it: I just typed wowza. Moving on. 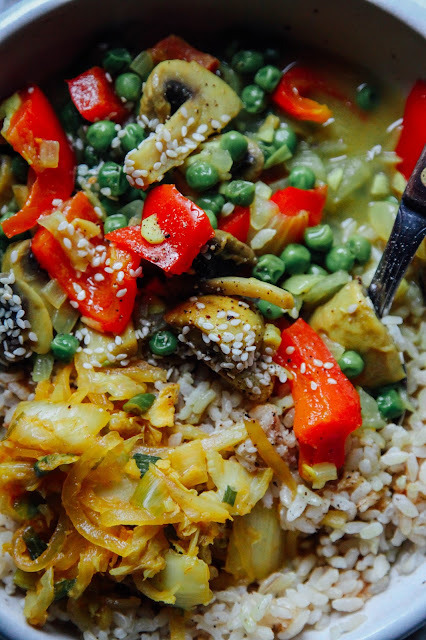 The turmeric is the reason this "green curry" isn't really that green. Turmeric makes everything orange or yellow. Remember that, kids. I have stained a great many things orange / yellow accidentally thanks to this flavourful lil plant (which sidenote: is a cousin of ginger). I added a few other veggies we had in the fridge and willed myself to make brown rice instead of white... cuz fibre and stuff. But white jasmine rice is sooooo good. It just makes me feel weird after I eat it. So brown rice AND some kimchi I made a few days ago, I added these to the curry before chowing down. If you want the recipe for the kimchi, let me know! I am happy to share it, though FYI it's mostly copied from The Kitchn. I truly hope you try out this recipe and enjoy it. I liked it. That is why I am sharing it. I just rewatched Bridesmaids the other night and want more. I don't usually do comedies but when I can actually see people like me all over the cast, I dig it. I am trying to expose myself to / support more women-centred media in general; podcasts, TV, movies, music, even university courses. Men still rule this overwhelming and often unjust world and that needs to change. Go, ladies. Let's eat. To make the curry: mince the onion, garlic and ginger. Roughly chop the mushrooms and bell pepper. Heat the coconut oil in a pot on medium heat and add the chopped onion, garlic and ginger. Once the onions are translucent add the curry paste and mix it into oil. Add the turmeric and black pepper, then the mushrooms and bell pepper, mixing it all up so the veggies are coated in the spices and oil. Add the coconut milk and let the curry simmer until it's thickened up and the veggies are tender. 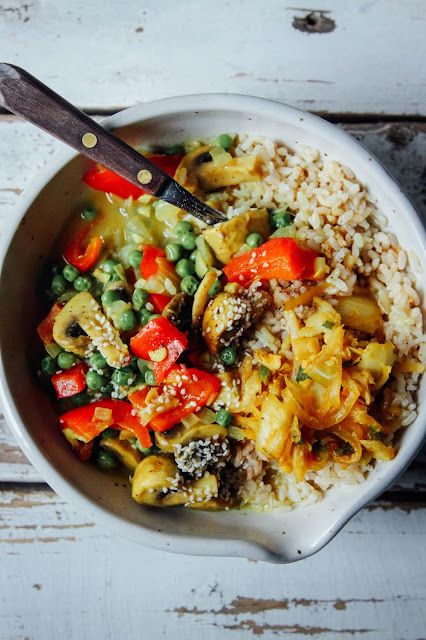 Throw in the peas and as soon as they are cooked, take the curry off the heat and enjoy it with some rice! This would be delicious topped with some roasted peanuts and cilantro as well. Just saying. I know a couple of films (how sad that I can only think of a few! )There's the secret life of bees (which is has themes of defying the status quo and oppresion, very good! ), green fried tomatoes, steel magnolias.....and older films: 9 to 5, working girl, a league of their own, how to make an American quilt. Yeah, there's this anticapitalist Czech film from the 90s called Daisies which you would absolutely love. And Mad Max of course. Have you listened to the Stuff Mom Never Told You podcast? Those ladies are amazing! I think women are totally amazing beings. God thought so too, after all, the woman was his final, crowning act of creation. Even the man, when he saw her, said "WOWZA!" Somewhere along the line, that went south. I agree with you, this world is often unjust, even within the Christian community. Men generally still rule, and yes, that needs to change. We weren't created to be second-class shadows. We women have the power within to influence the culture for the betterment of all, men and women alike. Yes, let's go Ladies! Let's be who we were made to be!